India is a country mostly visited by those who love to travel back to the time in form of sculptures. Kanheri Caves, Mumbai, Maharastra is one of such placed loved by all the tourists. This is one of the most pleasant and popular tourist places in Mumbai. Due to its rich heritage and history, Kanheri caves Borivali is a major attraction of all the visitors. Kanheri cave’s history has more surprises to offer than we think and its great visit to look at such ancient and unique sculptures. Kanheri caves is a cave that has been carved out of the basalt rocks. It lies around 5K.M inside the Sanjay Gandhi National Park. 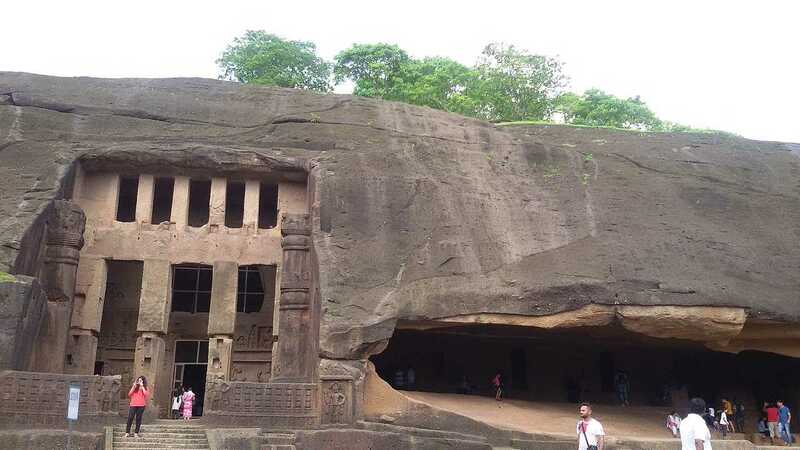 Due to the popularity of Kanheri caves, Sanjay Gandhi National Park is also popularly known as Kanheri National Park. Kanheri caves history is extremely interesting and it begins with its name itself. The name Kanheri has been derived from a Sanskrit word “Krishnagiri”. “Krishna” means “black” and “Giri” means “mountains”. When the question arises “how to reach Kanheri Caves?”, the answer is, its path is extremely adventurous and beautiful. You can take a car or a bus to reach Kanheri Caves once you are inside the SGNP. Another option is to reach the caves cycling. This gives you enough time to examine all the sculptures that deserve your attention. To travel the distance from the entrance of the Park to the caves you can borrow a cycle at the park at a little and reasonable price. To reach the Kanheri caves, you will also feel a bit of trekking and other adventures that you must not miss in your life. These adventures there are safe and exciting and it can be a memorable visit of your life. Archaeologists state that the different caves could have functioned as Buddhist sculptures and paintings. The cave comprises around one hundred and nine caves, carved out of the rocks. The oldest ones are comparatively plain and not much adorned whereas those which were built later are extremely adorned and embellished. Visiting the caves, you can find a stone in most of them that could have acted as a bed and some caves that are expected to act as halls had huge pillars in them. These caves are extremely old and in those times, these caves were the site for living, studying and meditating. Smaller caves were utilized for the living and meditating and the larger caves were used as the halls. Out of the 109 caves present at the site, Avalokiteshvara is considered as the most distinctive one. These cases indicate that the Buddhist had designed the structure very well and effectively. During the empire of Mauryan’, Kanheri was one of the University centres for Buddhist and even the famous Buddhist teacher Atisha also got her education from the same university under the guidance of Rahulagupta. The island of Salsette where Kanheri Caves are situated is peculiarly rich in rock temples. Among all the caves and rock temples on the island, the Kanheri caves are the most precious one. They are not the largest caves among them even it is quite smaller than others but they are architecturally important. They were initially described by the Portuguese visitors in the 16th century and by European voyagers like Linschoten, Fryer, Gemelli Careri, Anquetil Du Perron, and others. The cave is surrounded by the hills and it is present amidst the forests of the Sanjay Gandhi National Park. In the rains which are very usual and unpredictable in Mumbai, the view of the caves becomes even more beautiful. It’s such a pleasure to watch the colour of caves getting darker and the soil getting cosier. Even sometimes, you may experience a waterfall. In heavy rains, the caves construct a waterfall which is loved by the visitors. You may take bath there and enjoy the scene. It can also be a picnic places for a family. The greenery of the forest and unique architecture of the caves makes it an enjoyable as well as a knowledgeable picnic for the family. As Kanheri caves lie in the Sanjay Gandhi National Park, it gets better access and importance. It is a must visit site for all those who visit Mumbai. It has easy access through cars. You can take your cars inside the park up to the caves and then you have to step up some stairs. There are facilities for wheelchairs too. The only thing wrong with this precious site is its maintenance. The site has not been kept properly by the community and visitors should also take care of throwing wastes here and there.